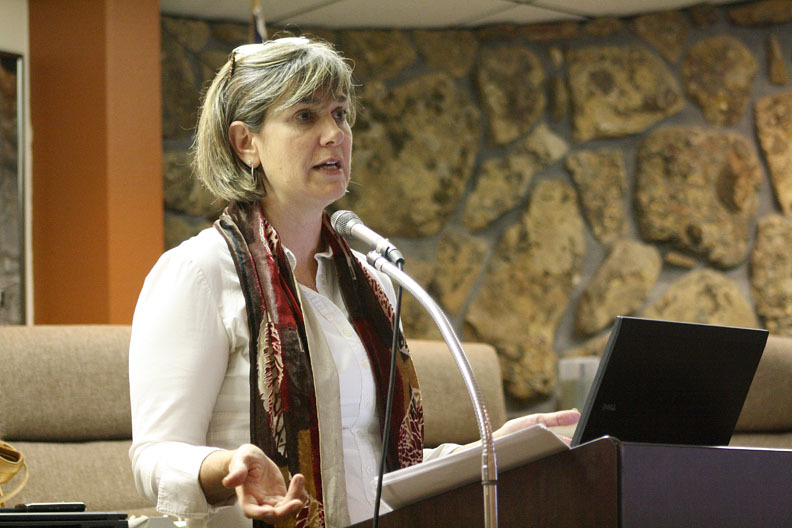 Sue Birch, Executive Director of Health Care Policy and Financing for the State of Colorado spoke to Craig residents about the changes coming with the advent of state and national health care reform Friday at the City Council Chambers. — Sue Birch, executive director of the Colorado Department of Health Care Policy & Financing, about the need for health coverage to meet health care reform goals. The election is days away and the big issue on the minds of voters, along with jobs and the economy, is health care reform. Gov. Mitt Romney, the Republican Party candidate for president, has pledged throughout his campaign to repeal the Affordable Care Act, also known as Obamacare, if elected. That’s music to the ears of a lot of small business owners in Craig and Moffat County who have raised concerns since Romney’s campaign stop in May about potential rate hikes for employee health insurance under the act. But regardless of who wins the office Tuesday Sue Birch, executive director of the Colorado Department of Health Care & Financing, said Friday the state would continue to press forward with its reforms for health care in Colorado. Birch on Friday discussed Obamacare and some of the health care reform initiatives taking place in Colorado with more than 35 local residents at Craig City Hall, 300 W. Fourth St.
Birch highlighted two bills recently passed in the state legislature designed to meet what people in the health care industry refer to as the triple aim, or finding the right person and the right service at the right price. One of those bills, SB11-200, the Colorado Health Benefit Exchange Act, was passed in May 2011 and developed the framework for an online marketplace where individuals and small business owners will be able to shop and compare the costs and quality of a variety of health insurance options. The site, http://www.getcoveredco.org, is scheduled to go live in October 2013 and Birch thinks, in time, it could control health insurance costs in Colorado. HB12-1281, the Medicaid Payment Reform Pilot Program, passed in the Colorado General Assembly in May 2012 and provided Birch’s office with the ability to experiment with different types of payment models in an effort to move away from a fee-for-service structure. If deemed successful Birch hopes the state will be able to build off of the pilot programs to vet out fraud, waste and abuse in the health care system, including outrageous fees, unnecessary tests and huge price variations common in a fee-for-service culture. For example, after the meeting Birch talked about a Craig woman who recently received a $1,900 bill for a Strep Throat test. But at the end of the day Birch said health care reform must begin by reigning in the number of uninsured people in the country. According to her office’s data 18.3 percent of working age adults and 9.3 percent of children in Colorado are uninsured.